The first mainland pup rescue of the season took place just one day later than last year! Well done to British Divers Marine Life Rescue (BDMLR) Coordinator Dave Jarvis and his team of Marine Mammal Medics for a highly successful rescue of a five day old white coated pup from Portreath. 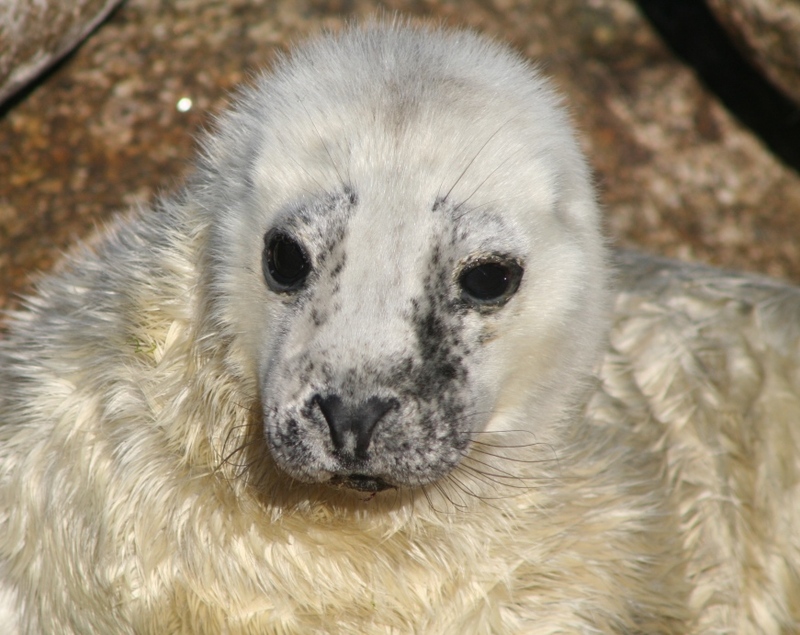 This seal pup is now in the safe hands of the Cornish Seal Sanctuary at Gweek where it will be looked after until it is big and fat enough to be released back into the wild. 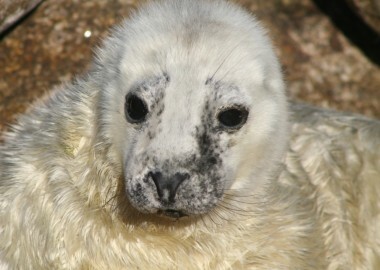 The second call out of the season to Portheras Cove was for a slightly more fortunate pup. 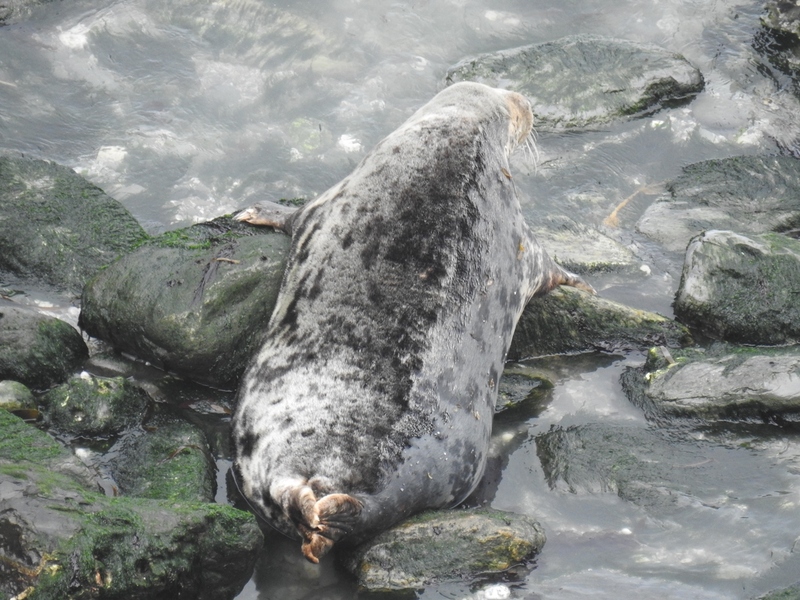 This lucky Portheras pup has its mum still present, as well as a team of people (in the form of the Friends of Portheras Cove led by Delia Webb) trying to help ensure it stays safe for the three week feeding period when it is totally reliant on its mum! We do need to give it time and space though by admiring from a distance and out of sight of the mum, who may have retreated to the safety of the sea, but be keeping an eyeline watch to her pup. Seal pups will die if their mothers are scared away Heavily pregnant female scared over boulders today! Mums about to give birth can be moved on by people, and if they stampede over boulders can actually injure their unborn pup or end up giving birth in inappropriate/unsafe places. Only today did was a hugely pregnant female scared into rushing over a boulder beach when she smelt, heard and then saw people on the clifftop above her. Bouncing quickly over boulders is the last thing that she and her unborn pup needed. Mum/pup bonds are most vulnerable – new mums may leave their pups when they feel unsafe if they see people nearby. If pups leave their birthing beach because of people or dogs then their mums are unlikely to find them ….or if people and dogs leave scent around a pup its mother may not be able to tell if it’s hers and so leave it. Pups are dependent on their mum and if usual ideal feeding cycles are not kept to (because people appear at feeding time) then pups don’t put on weight as fast as they should, don’t build up enough fat reserves and may end up underweight on weaning. They are then destined to die as they cannot teach themselves to feed fast enough, before their fat reserves run out. Please give our precious seal pups the space they need to survive.